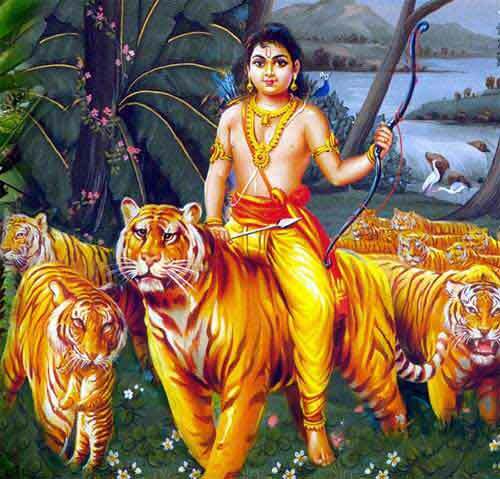 Lord Ayyappa, the son of Lord Shiva and Mohini (Lord Vishnu), symbolizes constructive destruction which is a combination of Vishnu (Creation) and Shiva (Destruction). He is considered the protector of the weak. He saves mankind from sickness, diseases, and miseries of the world and endows them with Jnana (knowledge) leading to spiritual liberation or Moksha. Since he represents both creation and destruction, Ayyappa is Harihara Sutha and he helps his devotee to destroy all low negative tendencies and maintains the pure Sattvic nature in the seeker. He protects our spiritual wealth and power by maintaining the thought of Godliness and destroys all other thoughts pertaining to the worldly infatuations. All along the ascent to the shrine, the devotee tries to maintain the one thought of the Lord. When such single-pointed concentration and meditation is maintained the Truth reveals itself to the seeker, which is symbolized by the Darshan of the Lord in the temple.